Items where Author is "Kanzow, Torsten"
Tippenhauer, S., Dengler, M. , Fischer, T. and Kanzow, T. (2015) Turbulence and finestructure in a deep ocean channel with sill overflow on the mid-Atlantic ridge. Deep Sea Research Part I: Oceanographic Research Papers, 99 . pp. 10-22. DOI 10.1016/j.dsr.2015.01.001. Meinen, C. S., Johns, W. E., Garzoli, S. L., van Sebille, E., Rayner, D., Kanzow, T. and Baringer, M. O. (2013) Variability of the Deep Western Boundary Current at 26.5°N during 2004–2009. Deep-Sea Research Part II-Topical Studies in Oceanography, 85 . pp. 154-168. DOI 10.1016/j.dsr2.2012.07.036. Baringer, M. O., Cunningham, S. A., Meinen, C. S., Garzoli, S., Willis, J., Lankhorst, M., Macdonald, A., Send, U., Hobbs, W. R., Frajka-Williams, E., Kanzow, T., Rayner, D., Johns, W. E. and Marotzke, J. (2012) Global oceans: Meridional overturning circulation observations in the subtropical North Atlantic. Bulletin of the American Meteorological Society, 93 (7: State of the Climate in 2011). S78-S81. Johns, W. E., Baringer, M. O., Beal, L. M., Cunningham, S. A., Kanzow, T., Bryden, H. L., Hirschi, J. J. M., Marotzke, J., Meinen, C. S., Shaw, B. and Curry, R. (2011) Continuous, Array-Based Estimates of Atlantic Ocean Heat Transport at 26.5°N. Journal of Climate, 24 (10). pp. 2429-2449. DOI 10.1175/2010JCLI3997.1. Rayner, D., Hirschi, J. J. M., Kanzow, T., Johns, W. E., Wright, P. G., Frajka-Williams, E., Bryden, H. L., Meinen, C. S., Baringer, M. O., Marotzke, J., Beal, L. M. and Cunningham, S. A. (2011) Monitoring the Atlantic meridional overturning circulation. Deep-Sea Research Part II-Topical Studies in Oceanography, 58 (17-18). pp. 1744-1753. DOI 10.1016/j.dsr2.2010.10.056. Send, U., Lankhorst, M. and Kanzow, T. (2011) Observation of decadal change in the Atlantic meridional overturning circulation using 10 years of continuous transport data. Geophysical Research Letters, 38 (24). L24606. DOI 10.1029/2011GL049801. Atkinson, C. P., Bryden, H. L., Hirschi, J. J. M. and Kanzow, T. (2010) On the seasonal cycles and variability of Florida Straits, Ekman and Sverdrup transports at 26° N in the Atlantic Ocean. Ocean Science, 6 (4). pp. 837-859. DOI 10.5194/os-6-837-2010. Baehr, J., Cunningham, S., Haak, H., Heimbach, P., Kanzow, T. and Marotzke, J. (2010) Corrigendum to "Observed and simulated estimates of the meridional overturning circulation at 26.5 degrees N in the Atlantic" published in Ocean Sci., 5, 575–589, 2009. Ocean Science, 6 (1). p. 1. DOI 10.5194/os-6-1-2010. Baringer, M. O., Kanzow, T., Meinen, C. S., Cunningham, S. A., Rayner, D., Johns, W. E., Bryden, H. L., Hirschi, J. J. M., Beal, L. M. and Marotzke, J. (2010) The meridional overturning circulation. Bulletin of the American Meteorological Society, 91 (7, S). pp. 66-69. DOI doi10.1175/BAMS-91-7-StateoftheClimate. Chidichimo, M. P., Kanzow, T., Cunningham, S. A., Johns, W. E. and Marotzke, J. (2010) The contribution of eastern-boundary density variations to the Atlantic meridional overturning circulation at 26.5° N. Ocean Science, 6 (2). pp. 475-490. DOI 10.5194/os-6-475-2010. Kanzow, T., Cunningham, S. A., Johns, W. E., Hirschi, J. J. M., Marotzke, J., Baringer, M. O., Meinen, C. S., Chidichimo, M. P., Atkinson, C., Beal, L. M., Bryden, H. L. and Collins, J. (2010) Seasonal variability of the Atlantic meridional overturning circulation at 26.5°N. Journal of Climate, 23 (21). pp. 5678-5698. DOI 10.1175/2010JCLI3389.1. Smith, G. C., Haines, K., Kanzow, T. and Cunningham, S. (2010) Impact of hydrographic data assimilation on the modelled Atlantic meridional overturning circulation. Ocean Science, 6 (3). pp. 761-774. DOI 10.5194/os-6-761-2010. Baehr, J., Cunningham, S., Haak, H., Heimbach, P., Kanzow, T. and Marotzke, J. (2009) Observed and simulated estimates of the meridional overturning circulation at 26.5° N in the Atlantic. Ocean Science, 5 (5). pp. 575-589. DOI 10.5194/os-5-575-2009. Baringer, M. O., Meinen, C. S., Johnson, G. C., Kanzow, T., Cunningham, S. A., Johns, W. E., Beal, L. M., Hirschi, J. J. M., Rayner, D., Longworth, H. R., Bryden, H. L. and Marotzke, J. (2009) The meridional overturning circulation. Bulletin of the American Meteorological Society, 90 (8, S1). pp. 29-65. Bryden, H. L., Mujahid, A., Cunningham, S. A. and Kanzow, T. (2009) Adjustment of the basin-scale circulation at 26 degrees N to variations in Gulf Stream, deep western boundary current and Ekman transports as observed by the Rapid array. Ocean Science, 5 (4). pp. 421-433. DOI 10.5194/os-5-421-2009. Kanzow, T., Johnson, H. L., Marshall, D. P., Cunningham, S. A., Hirschi, J. J. M., Mujahid, A., Bryden, H. L. and Johns, W. E. (2009) Basinwide integrated volume transports in an eddy-filled ocean. Journal of Physical Oceanography, 39 (12). pp. 3091-3110. DOI 10.1175/2009JPO4185.1. Johns, W. E., Beal, L. M., Baringer, M. O., Molina, J. R., Cunningham, S. A., Kanzow, T. and Rayner, D. (2008) Variability of Shallow and Deep Western Boundary Currents off the Bahamas during 2004–05: Results from the 26°N RAPID–MOC Array. Journal of Physical Oceanography, 38 (3). pp. 605-623. DOI 10.1175/2007JPO3791.1. Kanzow, T., Hirschi, J. J. M., Meinen, C., Rayner, D., Cunningham, S. A., Marotzke, J., Johns, W. E., Bryden, H. L., Beal, L. M. and Baringer, M. O. (2008) A prototype system for observing the Atlantic Meridional Overturning Circulation - scientific basis, measurement and risk mitigation strategies, and first results. Journal of Operational Oceanography, 1 (1). pp. 19-28. DOI 10.1080/1755876X.2008.11020092. Cunningham, S. A., Kanzow, T., Rayner, D., Baringer, M. O., Johns, W. E., Marotzke, J., Longworth, H. R., Grant, E. M., Hirschi, J. J. M., Beal, L. M., Meinen, C. S. and Bryden, H. L. (2007) Temporal Variability of the Atlantic Meridional Overturning Circulation at 26.5 N. Science, 317 (5840). pp. 935-938. DOI 10.1126/science.1141304. Kanzow, T., Cunningham, S. A., Rayner, D., Hirschi, J. J. M., Johns, W. E., Baringer, M. O., Bryden, H. L., Beal, L. M., Meinen, C. S. and Marotzke, J. (2007) Observed Flow Compensation Associated with the MOC at 26.5 N in the Atlantic. Science, 317 (5840). pp. 938-941. DOI 10.1126/science.1141293. Kanzow, T., Send, U., Zenk, W., Chave, A. and Rhein, M. (2006) Monitoring the integrated deep meridional flow in the tropical North Atlantic: Long-term performance of a geostrophic array. Deep Sea Research Part I: Oceanographic Research Papers, 53 (3). pp. 528-546. DOI 10.1016/j.dsr.2005.12.007. Johns, W. E., Kanzow, T. and Zantopp, R. J. (2005) Estimating ocean transports with dynamic height moorings: An application in the Atlantic Deep Western Boundary Current at 26°N. Deep Sea Research Part I: Oceanographic Research Papers, 52 (8). pp. 1542-1567. DOI 10.1016/j.dsr.2005.02.002. Kanzow, T., Flechtner, F., Chave, A., Schmidt, R., Schwintzer, P. and Send, U. (2005) Seasonal variation of ocean bottom pressure derived from Gravity Recovery and Climate Experiment (GRACE): local validation and global patterns. Journal of Geophysical Research: Oceans, 110 . C09001. DOI 10.1029/2004JC002772. Kanzow, T., Visbeck, M. and Krebs-Kanzow, U. (2016) Ocean Current Changes. In: Climate Change: Observed Impacts on Planet Earth. , ed. by Letcher, T. M.. Elsevier, Amsterdam, pp. 253-269. 2. Edition ISBN 978-0-444-63524-2 DOI 10.1016/B978-0-444-63524-2.00017-8. Cunningham, S., Baringer, M., Johns, B., Toole, J., Osterhaus, S., Fischer, J. , Piola, A., McDonagah, E., Lozier, S., Send, U., Kanzow, T., Marotzke, J., Rhein, M., Garzoli, S., Rintoul, S., Sloyan, B., Speich, S., Talley, L., Baehr, J., Meinen, C., Treguier, A. M. and Lherminier, P. (2010) The present and future system for measuring the Atlantic meridional overturning circulation and heat transport. In: Proceedings of the "OceanObs'09: Sustained Ocean Observations and Information for Society" Conference. ; 2 , ed. by Hall, J., Harrison, D. E. and Stammer, D.. ESA Publication, WPP-306 . OceanObs'09, Venice, Italy. Kanzow, T., Send, U., Zenk, W. and Rhein, M. (2005) Integrale Erfassung der Intensität der meridionalen Umwälzzirkulation im tropischen Nordatlantik. [Paper] In: Statusseminar 2005. . Meeresforschung mit FS SONNE. ; pp. 109-111 . Tippenhauer, S., Kanzow, T., Dengler, M. and Fischer, T. (2016) Overflow induced turbulence in a deep ocean channel. [Talk] In: Ocean Sciences Meeting 2016. , 21.-26.02.2016, New Orleans, USA . Tippenhauer, S., Dengler, M. , Fischer, T. and Kanzow, T. (2015) Overflow induced turbulence in a deep ocean channel. [Talk] In: EGU General Assembly 2015. , 12.–17.04.2015 , Vienna, Austria . Tippenhauer, S., Dengler, M. , Fischer, T. and Kanzow, T. (2015) Overflow induced turbulence in a deep ocean channel. [Talk] In: Warnemünde Turbulence Days 2015. , 31.08.-03.09.2015, Vilm, Germany . Tippenhauer, S., Kanzow, T. and Thurnherr, A. (2013) Vertical near-sea-floor ocean mixing in a valley at the Mid-Atlantic Ridge. [Talk] In: Scientific stay at Lamont-Doherty Earth Observatory. , 27.09.2013, New York, USA . Tippenhauer, S. and Kanzow, T. (2013) Vertical near sea floor ocean mixing in the central valley of the Mid-Atlantic Ridge. [Talk] In: IASPEI. IUGG Joint Assembly Gothenburg 2013 - IAPSO. , 22.-26.07.2013, Gothenburg, Sweden . Kanzow, T. (2012) Mooring-based observations of the Atlantic Meridional Overturning Circulation. [Talk] In: Physical Oceanography Seminar, Leibniz Institute for Baltic Sea Research Warnemünde (IOW). , 31.01.2012, Rostock/Warnemünde, Germany . Kanzow, T., Send, U. and Biastoch, A. (2012) Comparison of the Atlantic Meridional Overturning Circulation at two latitudes - 16°N and 24°N. [Talk] In: North Atlantic Climate Variability : International joint Conference EU-THOR and BMBF North Atlantic Projects. , 24.-26.09.2012, Hamburg, Germany . Fiedler, B., Stiebens, V., Kanzow, T. and Eizaguirre, C. (2011) Animal-Borne Oxygen Measurements on Loggerhead Turtles - An Interdisciplinary Research Project at Cape Verde. [Talk] In: MASTS Workshop on Fluorometry, Chlorophyll and Oxygen measurements from Animal-borne platforms. , 03.-04.10.2011, St. Andrews, Scotland . Kanzow, T. (2011) Die atlantische Zirkulation: Wärmeförderband im Wandel?. [Talk] In: Landesbeauftragtentreffen der Internationalen Physikolympiade. , 19.02.2011, Kiel, Germany . Kanzow, T. (2011) EU-THOR and European AMOC initiatives / plans. [Talk] In: CLIVAR Atlantic Implementation Panel - 11. meeting. , 25.03.2011, Miami, USA . Kanzow, T. and Cunningham, S. A. (2011) Observed and simulated large-amplitude fluctuations of deep northward volume transports in the subtropical North Atlantic. [Talk] In: EGU General Assembly 2011. , 03.-08.04.2011, Vienna, Austria . Kanzow, T. and Fischer, J. (2011) Post, current and envisioned activities in the Labrador Sea of IFM-GEOMAR (Kiel). [Talk] In: OSNAP West Meeting, Bedford Institute of Oceanography. , 26.04.2011, Halifax, Canada . 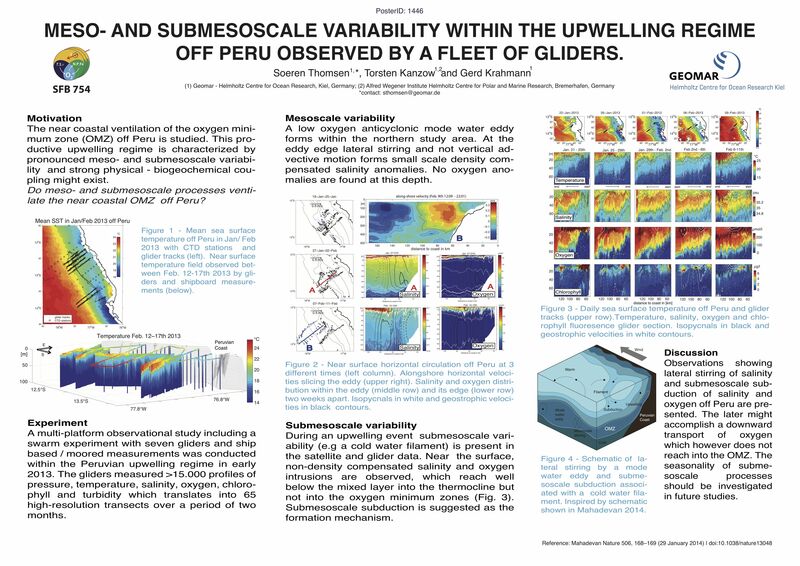 Kanzow, T. and Tippenhauer, S. (2011) Observation of small-scale variability from an autonomous vehicle in the central valley of the Mid-Atlantic Ridge. [Talk] In: Physical Oceanography Seminar, University of Bremen. , 06.12.2011, Bremen, Germany . Kanzow, T. (2009) Seasonal Variability of the Atlantic Meridional Overturning Circulation at 26.5°N. [Talk] In: Joint IAPSO / IAMAS / IACS conference. , 19.-29.07, Montreal, Canada . Kanzow, T. (2009) Seasonal variability of the Atlantic meridional overturning circulation at 26.5° N. [Talk] In: Physical Oceanography Seminar. , 12.02, Bremen . Kanzow, T. (2009) The Current State and Variability of the Atlantic Meridional Overturning Circulation. [Talk] In: IFM-GEOMAR scientific advisory board meeting. , 28.04, Kiel . Kanzow, T. (2009) A Northern Source for the Tropical Northeast Atlantic Oxygen Minimum Zone?. [Talk] In: SFB574 retreat. , 23.02, Kiel . Kanzow, T. and Cunningham, S. A. (2009) On the impact of large-amplitude fluctuations in deep integrated transports over sloping bathymetry on the vertical structure of the Atlantic Meridional Overturning Circulation. [Talk] In: EGU General Assembly. , 20.04, Vienna, Austria . Kanzow, T. and Cunningham, S. A. (2009) Large-amplitude fluctuations of deep transports over sloping bathymetry: Impact on the vertical structure of the Atlantic Meridional Overturning Circulation at 26.5°N. [Talk] In: US-AMOC annual meeting. , 04.-06.05, Annapolis, USA . Kanzow, T., Devey, C. W. and Lackschewitz, K. (2009) Vertical Near Sea Floor Ocean Mixing in the Central Valley of the Mid-Atlantic Ridge. [Talk] In: SPP1144 workshop. , 22.09, Etelsen . Kanzow, T., Johnson, H. L., Marshall, D. P., Cunningham, S. A., Hirschi, J. J. M., Mujahid, A., Bryden, H. L. and Johns, W. E. (2009) Basin-wide integrated volume transports in an eddy-filled ocean. [Talk] In: EGU General Assembly. , 20.04, Vienna, Austria . Kanzow, T., Send, U., Zenk, W. and Rhein, M. (2005) Integrale Erfassung der meridionalen Umwälzzirkulation im Tropischen Nordatlantik. [Other] In: BMBF Sonne Statusseminar. , 10.03, Warnemünde . Tippenhauer, S. and Kanzow, T. (2012) Horizontal mapping of near-seafloor vertical mixing. [Poster] In: EGU General Assembly 2012. , 22.-27.04.2012, Vienna, Austria . Zantopp, R. J. , Fischer, J. , Nunes, N. and Kanzow, T. (2011) Toward a synthesis of overflow transports in the Labrador Sea: The Outflow at 53N. [Poster] In: RAPID - USA MOC International Science Meeting. , 12.-15.07.2011, Bristol, UK . Kanzow, T. (2004) Monitoring the Integrated Deep Meridional Flow in the Tropical North Atlantic. (Doctoral thesis/PhD), Christian-Albrechts-Universität, Kiel, Germany, 140 pp. Kanzow, T. (2000) Integrale Erfassung langperiodischer Transporte: Simulation und Optimierung eines verankerten Systems. (Diploma thesis), Christian-Albrechts-Universität, Kiel, 95 pp. Kanzow, T. (2015) North Atlantic Ventilation - Cruise No. MSM 21/1b, June 9 - June 22, 2012, Reykjavik (Iceland) - Reykjavik (Iceland). . Maria S. Merian-Berichte, MSM21/1b . DFG-Senatskommission für Ozeanographie, Bremen, 73 pp. DOI 10.2312/cr_msm21_1b. Kanzow, T., ed. (2010) Expedition Report “Glider fleet”, Mindelo (São Vincente), Republic of Cape Verde, 05.03.–19.03.2010. . IFM-GEOMAR Report, 40 . IFM-GEOMAR, Kiel, 26 pp. DOI 10.3289/ifm-geomar_rep_40_2010. Kanzow, T., Thurnherr, A., Lackschewitz, K., Rothenbeck, M., Koy, U., Zappa, C., Sticklus, J. and Augustin, N., eds. (2010) FS POSEIDON Fahrtbericht / Cruise Report POS403, Ponta Delgada (Azores) - Ponta Delgada (Azores), 14.08. - 30.08.2010. . IFM-GEOMAR Report, 38 . IFM-GEOMAR, Kiel, Germany, 66 pp. DOI 10.3289/ifm-geomar_rep_38_2010. Kanzow, T. and Cunningham, S. A. (2008) FS Poseidon Cruise P343 [POS343], 4 OCT-17 OCT 2006 & FS Poseidon Cruise P345 [POS345], 28, NOV-7 DEC 2006 - RAPID-MOC Autumn 2006 Eastern Boundary and Mid-Atlantic Ridge Moorings Refurbishment Cruises. , ed. by Collins, J.. Cruise Report / National Oceanography Centre, Southampton, 28 . , 108 pp. Kanzow, T. (2012) 1. Wochenbericht MSM21/1b. . , 2 pp. Kanzow, T. (2012) 2. Wochenbericht MSM21/1b. . , 2 pp. Kanzow, T. (2012) 3. Wochenbericht MSM21/1b. . , 2 pp. Schauer, U. and Kanzow, T. (2017) One stop shop web site for TMAs. . AtlantOS Deliverable, D3.1 . AtlantOS, 5 pp. DOI 10.3289/AtlantOS_D3.1. This list was generated on Fri Apr 26 06:58:52 2019 CEST.